June In Nottinghamshire - It Must Be Cockpit-Fest! Aviation enthusiasts cover a broad range of interests and activities; from photography to spotting; fast jet fans to vintage voyeurs; die cast collectors to scale aircraft modellers; and the list could go on. Since then the museum has helped this aviation pastime become a permanent feature of the UK aviation scene under the event name of Cockpit-Fest. 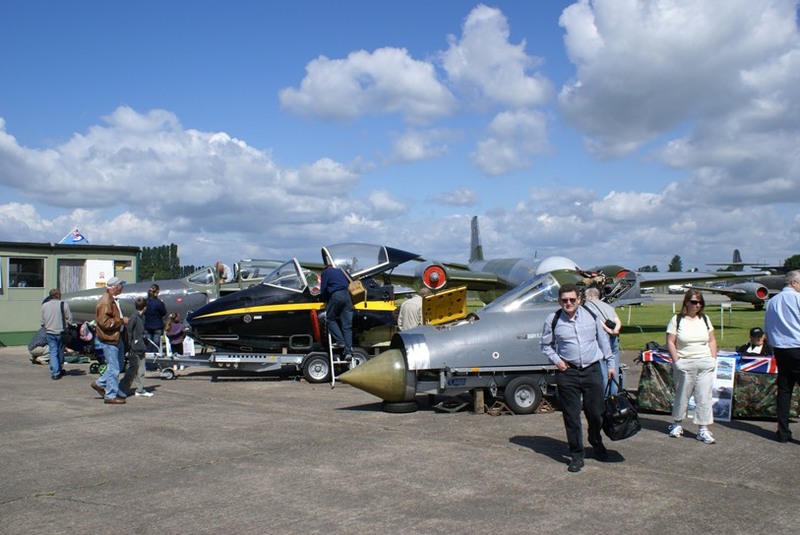 Whilst it might not appeal to everyone it nevertheless gives many aviation enthusiasts and the members of the general public the chance to get close and personal with some aircraft hardware. This two day event attracts exhibitors from across the UK and Europe and draws visitors from across the world including Australia, Canada and New Zealand, who come and sample "grass roots aircraft preservation". In so doing they can witness the hard work and countless hours that have gone into the painstaking restoration some unusual aircraft artefacts. Running alongside Cockpit-Fest is an Aeroboot aviation and avionics sale, which allows Cockpiteers and the public to search out those aviation artefacts, books and models. At the time of blogging there were 29 sellers booked in for the event including one who is travelling over from New Zealand. This year Cockpit-Fest takes place on Saturday 19th and Sunday 20th June and will feature flypasts on both days by fighter aircraft from the Battle of Britain Memorial Flight. Full details can be found on the museum website. * = a cockpit that has significant change from previous years. ** = a cockpit that is totally new to the event. Tornado Instrument Panels, Ejection Seats, 27mm Mauser Cannon. As we move closer to the event the various event details / listings will be updated on the news page of the museum website. It seems that no NAM Updater Blog would be complete without reference to the potential acquisition of a Nimrod R1. Again little has changed concerning this project and as previously advised as soon as we know more details they will be released via the museum website. That said some preliminary planning has taken place on the museum's Southfield Site to further evaluate where the previously mentioned exhibit might be displayed if and when it arrives!! Visit our forums to comment on this post. Aircraft Preservation - Frustrating, Challenging But Always Interesting! It's several weeks since my last Blog from Winthorpe Showground, during which time it may appear that not a lot has been happening at Newark Air Museum. As with so many things in life 'looks can be deceiving!' Much of the work that has been ongoing during that period is the boring detailed stuff, which on the face of it might seem unimportant - but in reality is vital to make things run smoothly. In recent weeks there has been a huge surge in interest in all things Nimrod with the first deliveries to air museums now imminent. Despite being one of the first museums to address the disposal rumours that circulated in the autumn, at Newark little has changed concerning our potential acquisition of an R1 airframe from RAF Waddington. As previously advised as soon as we know more details will be released via the museum website. Despite being open throughout the year like many tourist related venues Easter is traditionally the first really busy time for the main opening period. This year has been no exception at Newark, but this flurry of spring activity has been even more hectic with two fast approaching special events running before the end of April. First up is the Indoor Aeroboot Sale that takes place on 17th April 2010. Early indications are that this looks set to be the best ever event of this kind that the museum has hosted. More than 33 sellers have booked the 40 plus tables that will be arranged amongst the aircraft in Display Hangar 2. 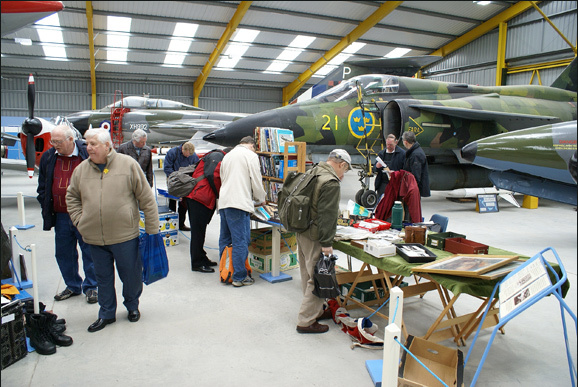 These sellers are travelling from all over the UK to participate at the event and buyers / visitors who attend this fund raising event will have the opportunity to search through a varied selection of aviation and avionic items: including books, plastic kits, die cast models, radio equipment and aircraft parts. Buyers / visitors at this event will be able to access the museum site on April 17th at a special discounted admission price of just £4.00 per person. Full details can be found in various listings here. 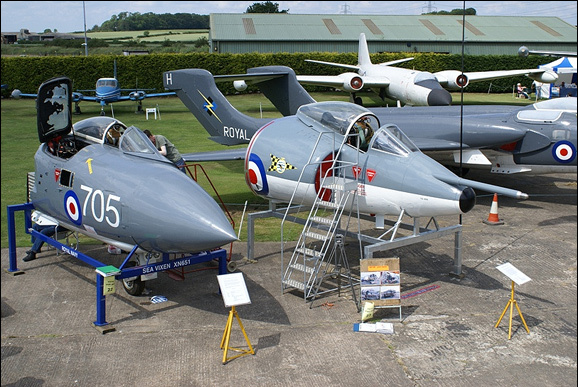 The following weekend the museum is hosting a Tribute to the V-Force event on 24th & 25th April, 2010. 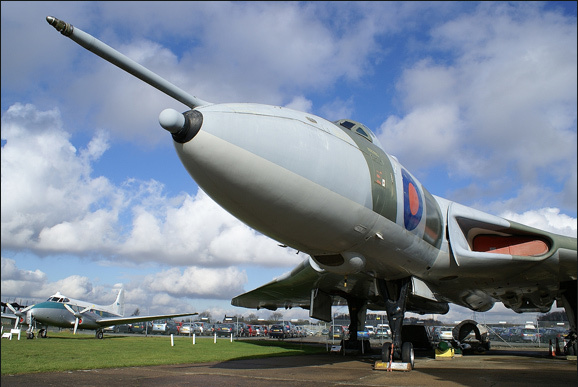 This event returns after a gap of nearly 6 years and brings together a diverse selection of organisations with connections to the 3 iconic aircraft the Valiant, Vulcan and Victor. A major part of the event is a reunion for everyone who served on any unit operating these aircraft, in any role, aircrew or ground crew; and this part of the event has its own dedicated website. This two day event involves a significant amount of organisation and once again full details of the various aspects to the event can be found in various listings on the news page of the museum website. Tribute to the V-Force will be hosted around the display hangars at the museum and the museum's own exhibits with V-Force connections; and the event is open to the general public so members of the public can get the chance to meet this special group of veterans. If this wasn't enough all the booking forms have just been sent out for the annual Cockpit-Fest event, which takes place each June. This year's event takes place on 19th & 20th June. This is a key recurring theme in many things that are now being undertaken in the development of the museum. We have long standing partnerships with other groups like the Lincolnshire's Lancaster Association, the Shackleton Association, BAPC and I guess you could even call this Blog a partnership with UKAR. NAM was notified just before Christmas that it had successfully secured a place on the Renaissance East Midlands Flagship Partnership Programme, which aims to support volunteer providers across the region. Our project aims to help the museum to recruit younger volunteers and encourage recently trained volunteers to disseminate their skills. It is envisaged this will be achieved through a variety of schemes and we will also seek support to formalise our volunteer recruitment processes and volunteer policies. This will help us continue to develop in the future. Grant funding was secured in 2009 for Nottinghamshire County Council's - Building Better Communities (BBC) Scheme. Woking in partnership with the county council we're developing a DVD based education resource for distribution to the county's schools. This will highlight Nottinghamshire's wide ranging aviation heritage and provide access to many items currently under-used in the Museum Archive. Work on this project is being undertaken by one of our member's who is a Heritage Studies student. NAM is currently seeking funding for an extension to the scheme to develop an Aviation Trail for Nottinghamshire, along similar lines to the excellent publication already produced by our neighbouring council North Kesteven District Council (NKDC). NKDC is actually another one of our partners; this time in the group that's now called Aviation Heritage Lincolnshire. NKDC has introduced a new 'Behind the Scenes Aviation Tour'. Whilst NAM is not a formal part of the tour other notable venues include: RAF Waddington, RAF Cranwell, RAF Digby Sector Operations Museum and the Metheringham Airfield Visitors Centre. You can download a PDF file from their website and that contains full details of the tour. Sadly there's still nothing more to report on the possible acquisition of the Nimrod R1 but when anything is agreed we'll ensure that everyone hears about it. Finally I would like to mention that NAM has joined the Just Giving online donation system to help people make web-based donations to the museum. In future this is likely to extend to specific fund raising appeals, whereby enthusiasts and the general public can partner with NAM. Further details about this new donation option can be found here. I delayed this latest blog in the hope that there might be more to report about the Nimrod R1, but as anyone who has visited the museum website recently will know there is nothing new to report on this project. As far as we are aware it's a case of waiting for everything to get sorted out before final decisions are made. Visitors to the website may have notice that it's received an 'upgrade'. This came about from comments made during our VAQAS (Visitor Attraction Quality Assurance Scheme) evaluation. The new site retains a lot of the original features, but hopefully now in an easier to read format. Since mid-October the museum has been carrying out a series of visitor exit surveys as part of the 'Audience Development' work that was mentioned in my second blog. So far we have received more than 250 responses, which is a statistically meaningful sample on which to start basing some of our forthcoming site development work. The main features coming out of this research indicates that our visitors want to see more Artefact Displays and more Temporary Displays. Themes they would like to see represented include: more Hands On / Interactive items and more displays about RAF Winthorpe. Interestingly the most important method for visitors hearing about NAM is 'word of mouth' - so please keep spreading the word. After Christmas we plan to start further evaluations of these data and review them alongside the feedback that has been provided by the enthusiast sector, including the comments made in threads on UKAR. One aspect that also comes over very strongly is that we need to provide more engaging activities for visitors to the museum. In the long-term this will result in new display themes, but in the short-term we plan to make more of what we have at the museum. In January we will officially launch a competition to help celebrate the anniversary of the formation of the Observer Corps. The aim of which is to not only appeal to the traditional visitors, but also to aviation enthusiasts and aero modellers. Based around the traditional types of recognition models used by the Corps for training; a montage of 39 'black models' has been displayed around the Royal Observer Corps dioramas in Hangar 1. Throughout January, February and March next year, visitors can try to identify the models in a free to enter competition. Each month £85 worth of vouchers to spend in the Museum Shop will be awarded to the three competition winners, at the following levels: 1st prize £50; 2nd Prize £25; 3rd prize £10. Full details, including the competition rules will be posted on the museum website over the Christmas holiday and the first entry forms will be available for visitors on January 2nd 2010. Further similar trails and competitions will hopefully be launched as 2010 progresses. As per normal the museum will be closed on December 24, 25, 26 and January 1; but all other days we'll be open from 10am until 4pm, with last admissions at 3pm. Before Christmas we hope that some of you might call in for those last minute presents, whilst after Christmas you'll be desperate to spend that money you've been given. One final thing to remember is that on December 27 the café will be operating on 'reduced rations' due to the inability to buy fresh stock because of the Bank Holidays. However we'll be offering hot drinks and 'free mince pies' for those that pay us a visit on those days. Season's greetings to everyone and at NAM we'll be keeping our fingers crossed that Santa can bring us everything that we want - in our case, details of whether (or when) we are getting a Nimrod R1! Early last week I was wondering what would be the main topic of the next blog; then along came a series of posts on a several web fora, and bingo… Nimrod R1! "Newark Air Museum has been given to understand that a Nimrod R1 aircraft will be retired from operational service sometime before the end of this financial year and then potentially dismantled to be sold as scrap. Eager to see this historic and prestigious aircraft preserved instead, initial enquiries have already been made to the RAF into the possible acquisition of this aircraft for display in the Museum, once it has been officially deemed surplus to requirements. It is still too early for the MoD to make any commitment at this time and the exact cost has yet to be established, but we are confidently aspiring to purchase the complete aircraft sometime in 2010." 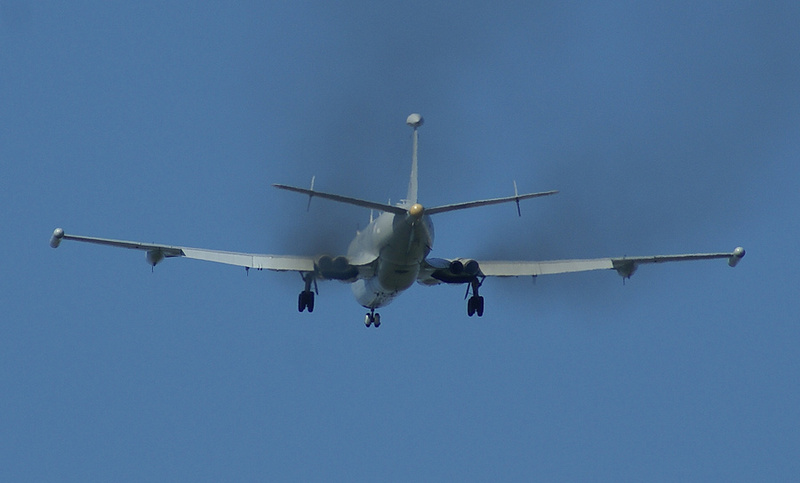 On a personal level I have to confess that the Nimrod is one of my favourite aircraft. If the acquisition is successful for me it would be a dream come true. Like many people at this year's Waddington International Airshow I was really pleased to get some shots of the R1 back in the air and livening up the crowds; and even more impressed with the quality of the landing shot my oldest son managed to capture. Obviously the type has attracted a good deal of press this year, sometimes for the wrong reasons. At this time of Remembrance I think we should all spare a moments thought for all the service personnel who have lost their lives in our defence; and I will have a few personal moments of reflection for the 14 Nimrod personnel who lost their lives in September 2006. My favouritism for the Nimrod came about in the early 1970s, when as a teenager I visited relatives who were stationed at Lossiemouth. Despite the obvious attraction of the on base access to Jaguars, Shackletons and even Gannets, my real interest was drawn up the road to Kinloss and the sleek elegance of the Nimrods. That interest was heightened during a hastily arranged base visit to Kinloss where I was fortunate to experience the 'airliner style' comfort of the then relatively new 'Mighty Hunter'. The confirmation came a few days later, with a look round an 8 Squadron Shackleton AEW.2, which as far as I was then concerned didn't pass muster! The irony of this viewpoint comes some twenty five years later, in that I co-authored two books about the Shackleton MR.3, which is displayed at the museum. 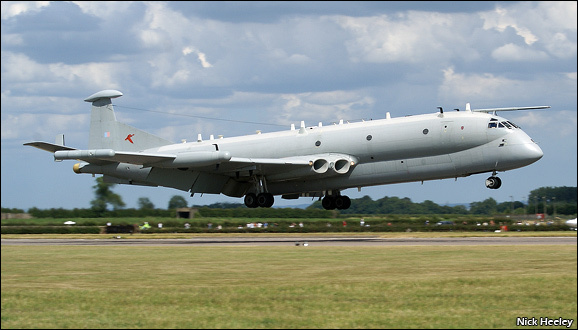 That said, the Nimrod remains my all time favourite aircraft and I hope that the R1 acquisition can proceed. Who knows it might give NAM the opportunity to develop the interpretation of its existing 'reconnaissance assets': Meteor FR9; Swift FR5; Canberra PR7; Shackleton; Gannet AEW3; Draken; Viggen; UAV display. As with the Viggen acquisition I am keeping project notes and hopefully one day I might be able to publish the 'full story' of the acquisition of a Nimrod R1. These provide an insight into what you the enthusiast would like to see. However when you look at it from the other side of the coin i.e. as a provider of services [Airshow organiser, aviation museum etc. ], then you're faced with performing a difficult balancing act. This becomes especially challenging when you have satisfy the expectations of both the general public and enthusiasts. This delicate balancing act is something that we're currently facing at Newark. As mentioned in my first blog, we're planning to build a new Visitor Centre on our Southfield Site. As significant part of the various grant application processes relates to a subject called 'Audience Development', which aims to try and widen visitor access to the museum and our collection. A major part of this process involves some basic market research work and at the present time we're particularly keen to hear from people that have not actually visited us yet and using the 'funding jargon' are described as 'Non-Users'. Earlier this week we posted a series of nine questions on the museum website aimed at gathering feedback from non-users. we would welcome your feedback. We also recognise that people who have already visited might also like to contribute, so you're also welcome to leave feedback as directed by the survey. We have already harvested comments on some of the threads that have run on this and other sites, which when combined together will hopefully give us a good feel for what people would like to see in and around the new Visitor Centre. In one of the recent threads some mention was made about Airshow venues staying open longer and turning more into evening events. Again with the 'providers' hat on, whilst this seems a simple idea to implement, in reality it can be a significant challenge to successfully manage staff working hours, servicing the site facilities etc - especially if you're a venue that's open all year round. We do have some experience of this at both Cockpit-Fest and on the Day-Night Photo Shoots. Each year at Cockpit-Fest we organise an evening gathering for the 'cockpiteers' in association with FlyPast, which is well received but nevertheless is very tiring for the staff and volunteers that help organise it. Likewise for the Day-Night Photo Shoot we do make additional provisions for opening later. However it's well worth the effort when you see and hear people enjoying so much banter and laughter - now where's that Arab headdress for our 'Mr Tango'? 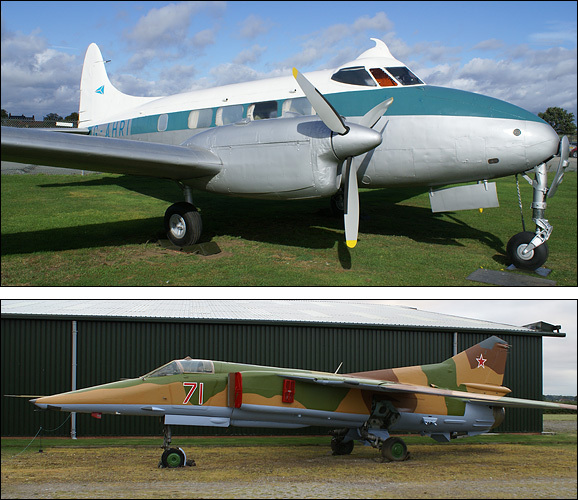 In recent weeks the museum staff and volunteers have finished off one aircraft repaint and 'half completed' another. Both projects look really good and illustrate that a lot of ongoing hard work and effort is being put in at the museum. By a strange coincidence a couple of months back I did a short piece in the museum's Dispersal newsletter about how the museum communicates with its visitors and the subject was briefly mentioned. If I might paraphrase from there - "I've been called lots of things but never a Blogger!" I originally joined UKAR to try and calm some of the misrepresentations that were starting to appear concerning the Viggen acquisition. As many of you will appreciate I've been a regular 'poster' since then and I've always tried to keep everyone accurately informed about things that are happening at the museum. I will aim to do a similar thing with this first and indeed future Blogs. For those that don't know, Newark Air Museum is a members' based organisation and as such anyone can pay the membership fee to become a member. In so doing you will gain all the benefits that membership confers and some of that information is detailed here. Due to this set-up occasionally there might be items that we need to communicate to our members first, before it comes into the public domain. That having been said I will always endeavour to keep everyone on here as up to date as possible with events in eastern Nottinghamshire. The museum was formally registered as a company in April 1968 and then became a registered charity in September 1968; a dual status it still holds today. The museum is also 'Accredited' by the Museums, Libraries and Archives Council (MLA). The MLA's Museum Accreditation Scheme sets nationally agreed standards for all museums in the UK. Newark Air Museum's award proves that it measures up, meeting the latest guidelines on how it is run, how it looks after its collections and the services it provides its visitors. Whilst the museum does have a mix of full and part-time staff the major management is undertaken by a board of trustees, who like me act on a voluntary basis; hence the often used phrase - "that Newark Air Museum is one of the UK's largest volunteer managed aviation museums!" On a personal level I joined the museum as a local school boy back in 1973, just before it officially opened to the public. In one capacity or another, I have been involved at Newark ever since. For anyone that has visited the museum you will appreciate that we have a split site. This sees one set of buildings set out around an original wartime dispersal point on what was part of RAF Winthorpe; whilst over on our Southfield Site we have Hangar 2, which was constructed with a major grant from the Heritage Lottery Fund back in 2004. The museum owns the land that makes up the Southfield Site and leases the other land. We are currently at the start of another exciting phase in our development, which will hopefully see major strides taken to develop our Southfield Site. This looks set to be in the form of a new Visitor Centre, which will provide enhanced facilities for a whole range of museum-users. This project is still at an early stage but it is already receiving positive feedback from a variety of potential funding sources - obviously as things develop I will keep you informed. However as always this will require a significant fund raising effort from amongst our volunteers and visitors and a lot of form filling. It's always worth remembering that each time you pay to visit the museum you are contributing to the preservation of part of our aviation history - you can always make an even bigger contribution by using Gift Aid or by making a one off donation to the museum. The museum website is used a lot to keep people advised of ongoing work, new products in the Shop, provide event update etc. This is normally posted in the news section. With nearly 70 aircraft and cockpit sections to look after there is always a lot of work in progress at the museum. Currently these are a few of the aircraft that are being actively worked on: Chipmunk, Monospar, Meteor NF14, Dove, Harvard, Sea Vixen, MiG 27, Shackleton, Sea Venom and T33. Like so many similar places, we know that things are not always perfect at Newark Air Museum - but we do always listen to new ideas and try to implement them as and when funds are available. Here's looking forward to the next instalment from Newark! 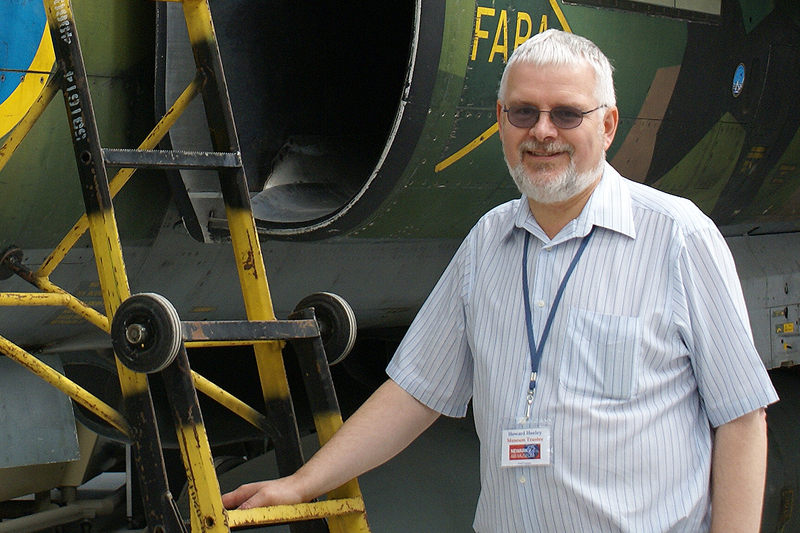 Howard Heeley has a life long interest in aviation, which stemmed from his early school days in Newark and was firmly established by the time he became a member of the Newark Air Museum in 1973. A trustee for nearly three decades, Howard has held the position of 'Secretary to the Museum Trustees' for the last 12 years. After initially working in scientific research, which whetted his appetite for investigative aviation research, Howard then spent a twenty year period working in industrial marketing and promotions, which enhanced an interest in writing and publicity. Since February of 2003, Howard has been working on a self employed basis in marketing and promotions, trading as 'Down To Earth Promotions'. During this time he's undertaken some freelance aviation writing with a range of articles and photographs published in FlyPast, Aeroplane, Aircraft Illustrated, Pilot, the BBMF Yearbook etc and a wide range of aviation websites. 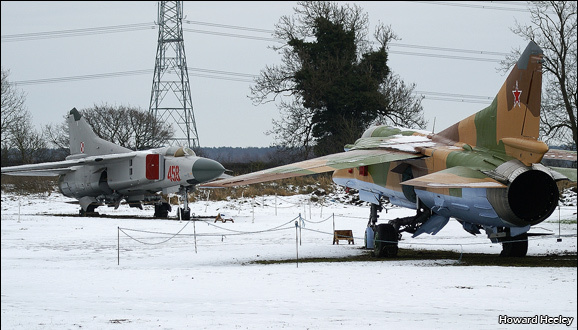 In his own words, Howard lists a couple of his museum highlights (so far): "The first would be back in 1983, helping to arrange the Vulcan delivery - the largest aircraft flown into Winthorpe and the only one at the time to go into a non-licensed airfield. Plus helping to secure a Heritage Lottery Fund grant of £453,000 for the second display hangar on the Southfield Site - I still feel a sense of pride every time I walk into that building!"